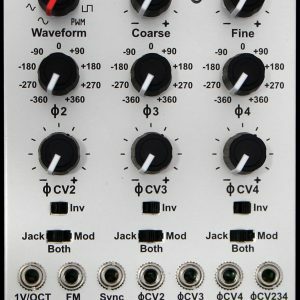 The uHC is a very powerful dual VCF with an integrated mixer to pit the two sides against each other producing complex waveshapes and artfully sculpted timbres. The uHC incorporates versatile audio signal flow with intuitive CV control and normaling, creating a powerful filter without the need for complex patching. The uHC is a dual state-variable VCF with all CV inputs of the first filter normaled to filter 2. The uHC can be used as a 4 pole filter, two independent 2 pole filters, or some combination in between. A voltage controlled mixer blends the two ouputs, providing another dimension of waveshaping. Filter 2 can use one of the following as its input: the output of Filter 1 (series), the input of Filter 1 (parallel) or it’s own input (split). Voltage control of Frequency and Resonance is provided for each filter section. Signal paths for audio and CV are shown with arrows to speed up patching. This flow chart shows the audio and how it is routed around the Micro Hadron Collider. Click the image for a larger version. The blue lines are for the Audio Expansion module (5HP; sold seperately), providing dedicated filter outputs and additional audio inputs. The CV signal flow is much simpler. 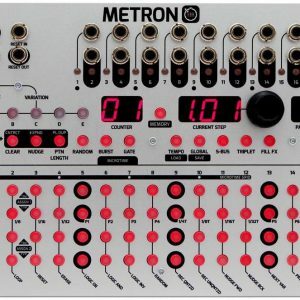 Knobs at the top control the offset of the frequency, resonance or mix. CV In jacks at the bottom with attenuators control their respective parameters. The CV inputs from Filter 1 are normaled to Filter 2. So plugging in a cable to Freq 1 will send the same signal to the Freq 2 jack, where it can be used or dialed out by attenuating fully CCW. This allows you to use one signal but control both filters equally, offset, or completely seperately. The 1V/Oct input is calibrated to produce exactly one octave of change per volt of input. Using the switch on the Filter 2 side will route the 1V/Oct signal to Filter 2, controlling both simultaniously. For additional CV controls, a CV Expansion module (5HP) may be attached to the uHC with it’s own 14 pin cable. The CV Expansion provides additional Frequency, Resonance, and Mix inputs with attenuators. 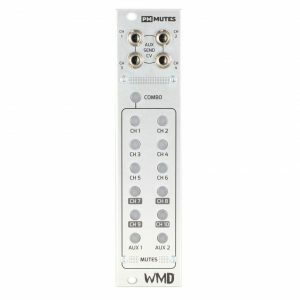 It also provides linear frequency input for each channel. The jacks are normaled here as well, so you can control both filters with one cable. The uHC is a multimode filter and outputs Low Pass, Band Pass and High Pass filter responses. Additionally Filter 2 has a notch output for elliptic filter responses. The switch just inside each output jack selects the filter mode. 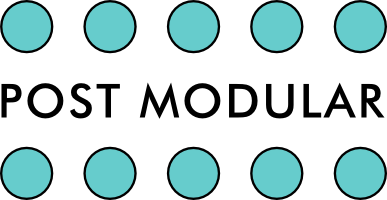 If multiple modes are required simultaniously, the Audio Expansion module provides dedicated outputs and a Notch output for Filter 1. Using series mode and low pass or high pass on Filter 1, the notch output on Filter 2 creates an elliptic response. This leads to sharper cutoff frequency, but with a bounce back at around -40dB. Set the two Freq knobs to ear for the elliptic response. For low-pass elliptic, the 2nd filter will have a slightly higher cut-off frequency than Filter 1. Lower resonances on the 2nd filter tend to produce better results (as the notch will be wider). What sets the uHC apart from most other VCFs is the integrated voltage controlled mixer. The mixing circuit takes each output and smashes them together creating all different kinds of sounds without loads of extra patching. 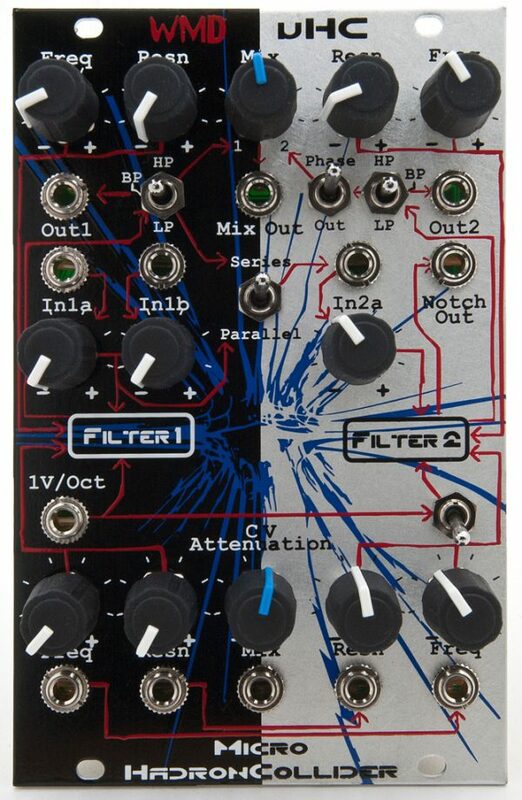 It can be used to create different and new filter modes — Wide Notch, Dual Bandpass, etc. Also, for blending seperate sounds together using both filters split. Additionally, the mixer can be used without CV to blend just a little bit of high frequency punch with your fatty dub bass sound. The possibilities are endless. The Mix CV input accepts DC to audio rate signals (and super-sonic) allowing for cool frequency modulation of the mixing signals. Use Square wave with variable duty cycle to make some very interesting wave shapes! Filter 2’s input to the Mixer has a phase switch to invert the signal, providing more control over the mix output. 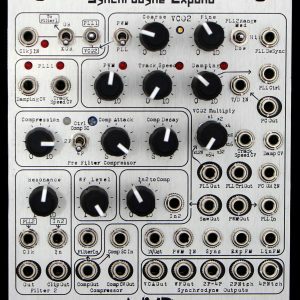 The expansion modules, each just 5HP, provide additional inputs, outputs, and modulation options. The audio expansion features dedicated audio outputs plus a notch filter output for Filter 1, and two inputs per filter for summing any combination of signals to create thick and deep tones. Inputs 1D and 2C are inverting inputs so you can experiment with phase interactions. The CV Expansion features additional inputs for all controllable parameters in the uHC. It also provides a linear (FM) input for each filter frequency. These inputs are normalled from Filter 1 to Filter 2. Jack in to break the normal, or dial down to ignore it. Expansion modules are supplied with a 14 pin cable and connect only to the uHC. No external power is required. The uHC is entirely analog. Using modern surface mount technology allows for very short signal paths which reduces stray capacitances and noise. We use 1% resistors, 2% PPS filter capacitors and factory matched transistor pairs creating a very stable and repeatable filter capable of very high Q factors. It is entirely DC coupled and can be used to process control voltages. Current consumption: 80-100mA +12 rail; 70-85mA -12 rail with Audio Expansion Module .